All of us doing the car hobby have moments of self doubt – just why am I doing this? Money and energy expended achieving what? 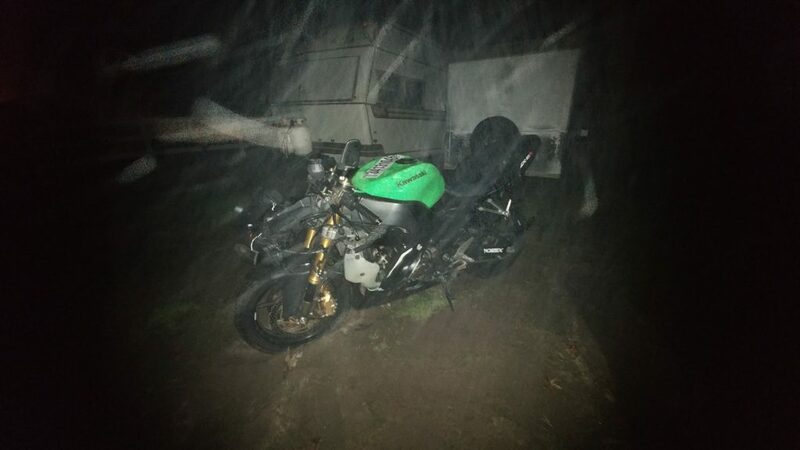 Standing in a muddy field at 11.30 on a blustery, rainy winter night having just got my new Kawasaki ZX10r so stuck I could dismount without needing the side stand certainly gave me pause. Last year in Miami, pottering around an art gallery, I was surprised and amused to find a brush painted Kawasaki ZZR up on a plinth amongst the other works of sculpture. Hipster latte sippers who would stroll past a new H2 or an old triple cylinder widow-maker parked kerbside contemplated it pensively. 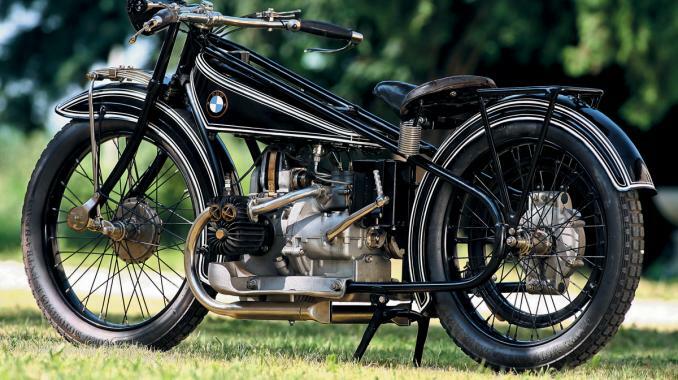 Perhaps the art here is in the video, not the machines, however for me this is proof that all motorcyles are art. Developing this, non-running bikes can be seen to be valid as art, as sculpture, as they sit, not running. Years ago watching Luca di Montezemolo speak at Stanford I was struck by the fact that he looks for inspiration in the world outside cars, especially the world of fashion. He spoke of seeing a shape or color he liked in Vogue, ripping out the page, and putting it on a designer’s desk. Watching a clothes designing reality TV show, the Avant-Garde challenge is important: it is important to encourage completely off the wall ideas and designs, even though most are merely ridiculous, since the few that succeed are so spectacular. Success is not about any practical application or utility, but rather about the initial impact, the runway moment and a concept which has never been seen before. Hence I decided some avant garde bike collecting. I am usually drawn to the travel stained, the worn, the patina’d car or bike. It’s something to do with the life experience which is illustrated by the patina/damage. The rally driving virtuoso, Ari Vatanen once said that a rally car without dents was a life unlived, and developing this idea, the downed and then repaired sportsbike hints of blood, adrenaline and fear – among the most intense of human experiences. Thanks to Copart I was flooded with options, and I began to dream. 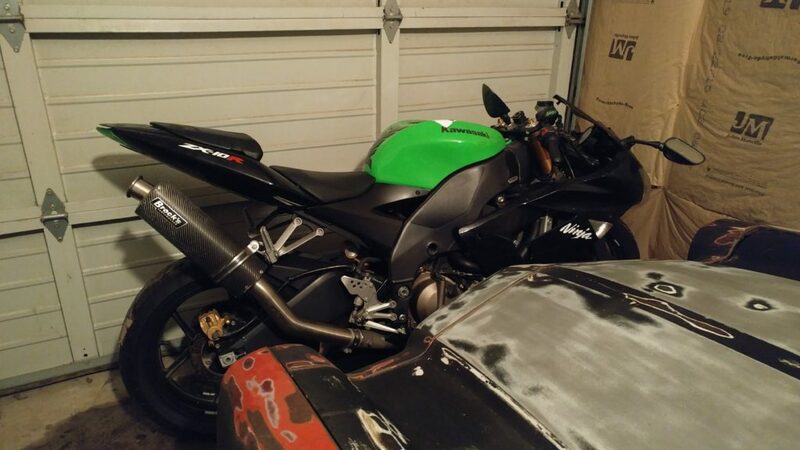 In 2003, I made some huge life changes, moving from London to Rome, and stepping away from the kind of job which generated an income which made a new sportsbike an attainable dream. As that happened, Kawasaki launched the ZX10, their first proper attempt to take on the liter bike offerings from Yamaha Honda and Suzuki. Boasting 181hp “with ram air at 180mph”, the new ZX10 had 20hp more than anything else on offer. It was the reaction of the journalists writing about it which stuck with me: fear not just of the collosal thrust, but of the twitchy on the limit handling. 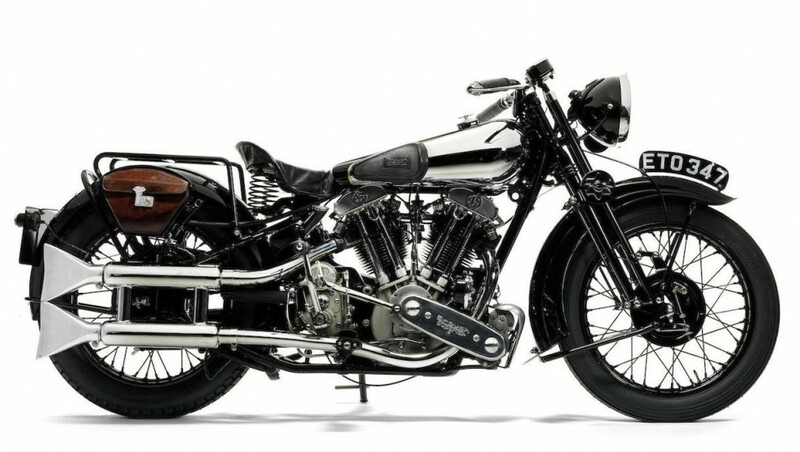 With hindsight, it can be seen that this bike was the high watermark of massive power without any of today’s electronic aids such as traction control, and ABS. The pinnacle it stands atop is that all earlier bikes weren’t as fast, while later ones may have more speed but, thanks to the electronic aids are far easier and safer to ride. Adjusting to a lower income and living bike free in Rome seems to have ingrained the 04-05 ZX10 in my mind as a pinnacle illustration of why people ride sportsbikes. 5k buys a nice one. Mine was $775. It shows around 19 thousand miles, and to my surprise and pleasure already has a Power Commander and after market exhaust. And a green tail light. The green tank suggests it was originally all green, and that the black plastic you see is likely the result of a fall prior to the one which precipitated its visit to Copart. 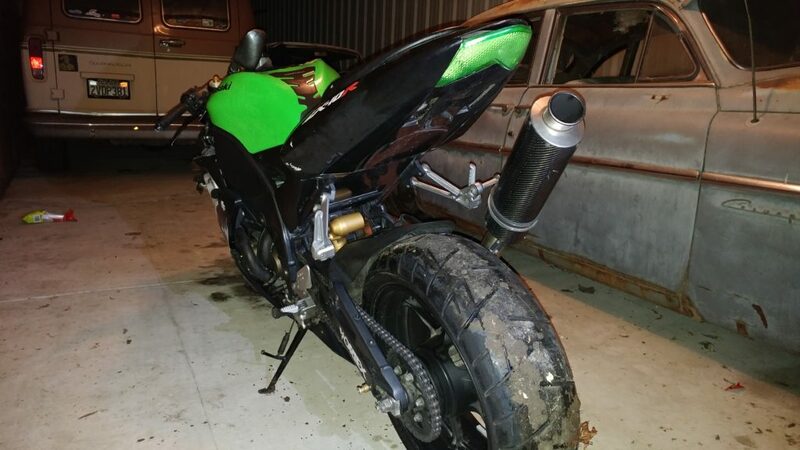 New, this was a badass bike. But how much more badass is it now, downed, fixed, downed again and written off, yet still ready for a 180mph blast on the freeway. Are you scared yet? Will it ever be worth real money? 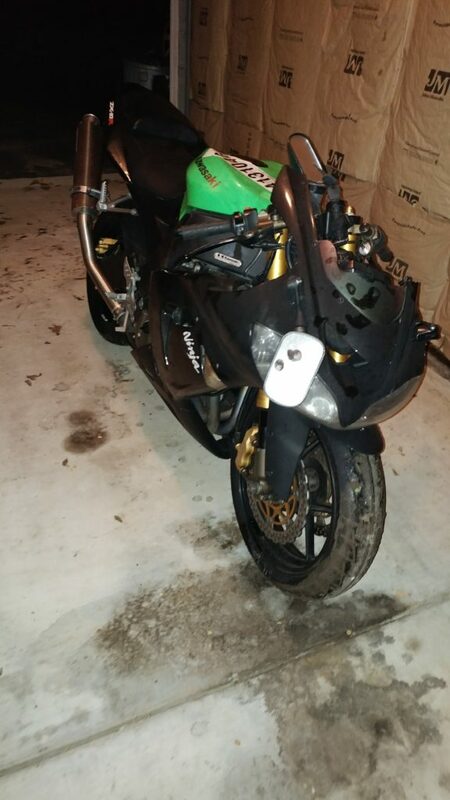 Doubtful; worth 3k as sits, 4k running, and is unlikely to ever be worth less – the CBR is worth what I paid for it ten years on. Not cafe, not retro, not hip. Very cheap, very fast, very frightening. Sublime art. 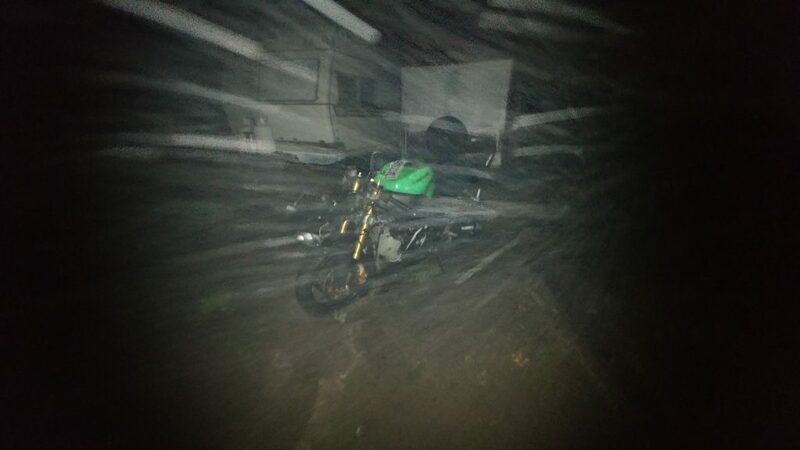 Returning to the rainy field for a moment, the bike was for sale at a Copart yard in Minnesota; I had it towed across the country. 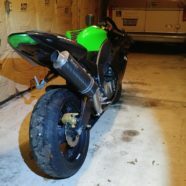 Vehicle towing is a janky business; I paid a broker who sourced a truck, only for the driver to call me directly, bleating about not being able to drive in San Francisco, and could I come and collect the bike from Livermore? Like I have time and a truck to drive two hours to collect a bike I am unable to unload on my own, because he accepted a delivery he subsequently decided he couldn’t make. 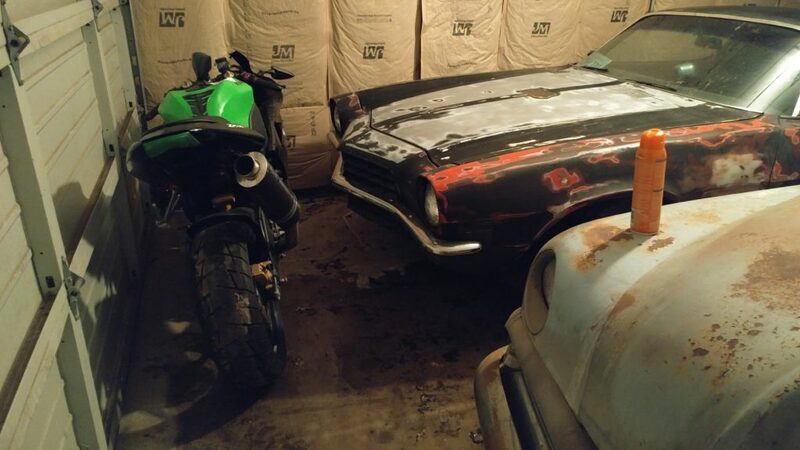 The Copart ad said it ran, and I daresay it had back in Minnesota three weeks before, but it didn’t when I got to it. I suppose being on the back of an open truck crossing north america in January might allow a little moisture ingress. However, Dufus the Delivery Driver had already left by the time I realized it wasn’t going to start, and thus it needed pushing into my storage spot from the rough piece of land where Dufus had dumped it. In attempting this I succeed in getting it stuck in the mud. These images were captured with the bike vertical without needing a stand, so wedged in sticky mud was the front wheel. Luckily, I have a good friend who lives nearby, and I asked him to help push me out. He would help on principle, but I knew he would be rewarded by the unexpected nature of the call, since I normally only see him at Concours events, particularly Pebble Beach. I think my explanations of Miami art galleries and the avant-garde sounded like delirious ravings to him, but I am sure he got a good story out of it. A few months went by, and the bad taste left in my mouth by Dufus particularly, and the experience as a whole, faded and by the spring I found time to poke around my new purchase. I had guessed that some time to dry was all that was needed – it runs well, although the exhaust is damaged. I have closely inspected the frame, and while it seems fine, I admit to having the Fear, and will take it to a frame checking place before I waste time trying to make it road worthy. 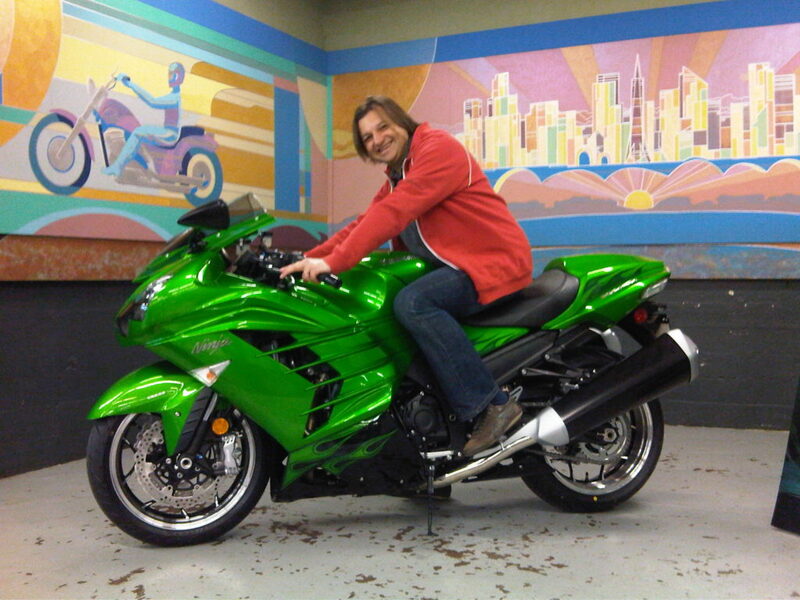 Then, it has to go thru DMV registation, before I have the baddest bike ever, which I shall ride like a timid old lady.